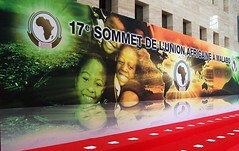 Mediation efforts in Libya and Sudan were high on the agenda at the AU summit in Malabo. While observer missions at the summit tried to influence African delegations during closed-door meetings on issues such as the crisis in Libya. Somalia’s Shebab rebels are “a spent force”, Deputy Prime Minister Mohammed Omaar told RFI in an interview at the AU summit in Malabo. Omaar promises a new president will be elected next year and insists that government forces will win territorial control. The Sudanese government and the Sudan People’s Liberation Movement signed a deal that aims to bring an end to fighting in the border state of South Kordofan. There has been heavy fighting in South Kordofan since 5 June between government forces and militia aligned to the SPLA, the ex-rebel army. The agreement follows mediation efforts by AU mediator and former South African President Thabo Mbeki. The conflict has displaced more than 70,000 people, according to the United Nations. The theme of this year’s AU summit in Malabo is youth empowerment. The empowerment of youth has not been felt more strongly in recent times than in Tunisia or Egypt. In Egypt violent protests once again hit Tahrir Square on Wednesday having a knock-on effect on the country’s currency, which hit a six year low. The 17th African Union rounded up in Malabo on Friday. Following a number of meetings the AU tabled a proposal for a framework agreement on a political situation to the crisis in Libya. This agreement complements the work of the AU’s high-level mediation group and calls for continuing dialogue. But with the acceptance of Libyan leader Moamer Kadhafi that he will not be part of the negotiation process. After the summit’s closing ceremony South African President Jacob Zuma gave a press conference.